Many, I'd say MOST, people I've met on trail listen to music while they hike. It's a great way to help pass hours of walking, especially on the less interesting portions of long trails. And, with electronic music players so tiny and inexpensive, it's very easy to provide a little entertainment along your walk. I've tried it on one long hike. My wife loaded some albums on my cellphone and showed me how to get it to play song after song, one after another, cycling through dozens of tunes. It was a big change to get used to for me. I felt like I was insulated and missing out on the natural sounds around me. My stress raised a bit because I wondered if something important was happening around me that I didn't notice - like a snake, mountain lion, or bear sneaking up on me. Or, more seriously on roads, a car approaching - I'd never consider plugging my ears on a road walk. So, I don't listen to music much while hiking. Do you? Has it ever caused you any problem? The fact that I don't have earbuds in doesn't mean I don't enjoy songs while hiking. I will often hum or even try to sing songs, especially ones that have a beat close to my footsteps. I've found that can really help me keep my pace going longer and I think it helps me do more miles. I tend to sing out loud more when I'm solo hiking in remote areas - I once had a summer job peeling paint off camp buildings just by singing at them. Here's a very old song that pops into my head when I'm plodding up a long hill, or sometimes a never-ending flat section. I guess it's kind of my Hiking Mantra. 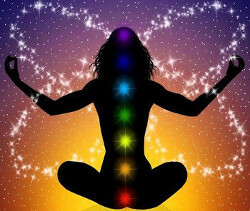 It gives me energy, lightens my mood, and makes walking fun again. Plus, it can make the hot sun feel a little cooler. What about you? Do you have any favorite songs you like to sing out loud, or just listen to for motivation, when hiking? Maybe I can give yours a listen. Hey, last night we talked to a couple dozen people at our church about our PNT thru-hike, and it got recorded. So, if you have 45 minutes (or more) to spend, you can have a look. Yesterday, we had a fun time talking about our PNT thru-hike to a standing room only crowd of about 70+ folks at the Midwest Mountaineering Expo. It was entertaining to remember and joke about things that happened along the trail. One of the things that continues to pop into my mind often is the first day in Glacier when Josh fell off the trail. It makes for a great story now, but was about the scariest moment I can recall from all my miles on trail so far. 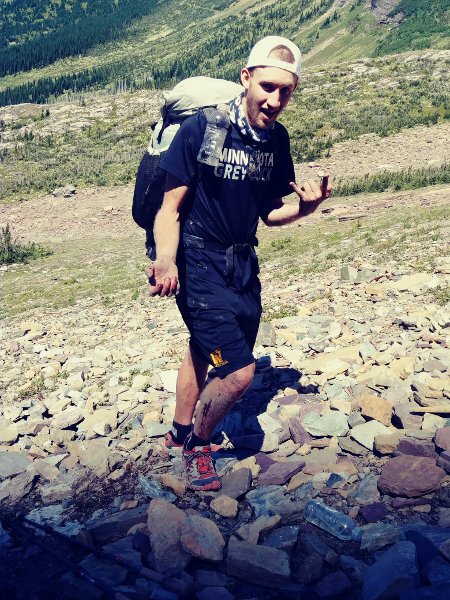 Traversing a steep snowfield, he slipped and slid for more than 50 feet to the rocks at the bottom. From my view above him, I only saw a cloud of ice crystals as he tried to dig in with his feet and hiking pole handles to slow down. Pretty helpless feeling, just standing there and watching him hurtle towards the end of the snow where it turned to rock. When he hit the rocks at the bottom, the cloud of ice turned into a cloud of dust. I've hit rocks at the bottom of a glissade before, and it is very dangerous! Luckily, it was all smaller shale and not solid rocks and boulders so he skidded on it to a quick stop. As you can see, he took a beating with lots of cuts on hands and legs, but nothing deep. I checked him out and all his joints and muscles still worked, and there was little bleeding, so we climbed back up to the trail past the snowfield. A few weeks later, all the cuts were healed and scarred (which he still has) and they are a reminder of how a split-second can change a fun time into an emergency. Even being trained, cautious, and aware, accidents can still happen so you should have some wilderness first aid skills before going into the wilds. 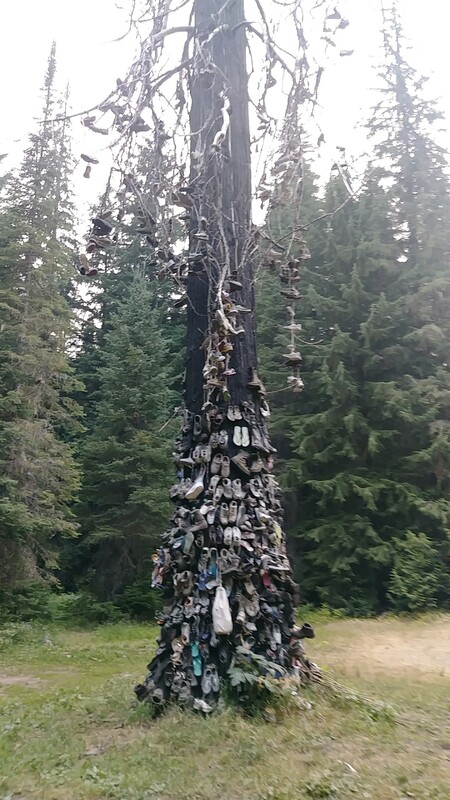 When you're hiking for two months, you're bound to encounter some strange things. In eastern Washington, we had to take a very long (like 50 miles) detour due to wildfires. Along this reroute, while looking for a place to camp at the end of the day, we found this crazy tree. Yes, it's covered in hundreds of shoes, boots, slippers, all sorts of footwear. For the next few days, we asked folks if they knew of it. Only a couple knew what we were talking about and they just said 'folks nail their old shoes to it', but they didn't know why. Another strange thing we found were rocks painted yellow scattered in an alpine meadow on the very top of a mountain. The mountain is Bunker Hill in the Pasayten Wilderness in Washington. We found some old structure foundations on the hilltop also. The meadow was dry, dead grass so I walked around the rocks and finally figured out what they were. If you click the link below, I think you'll figure it out also. Yes, they weren't actually scattered around. They were arranged. One last strange thing I recall. 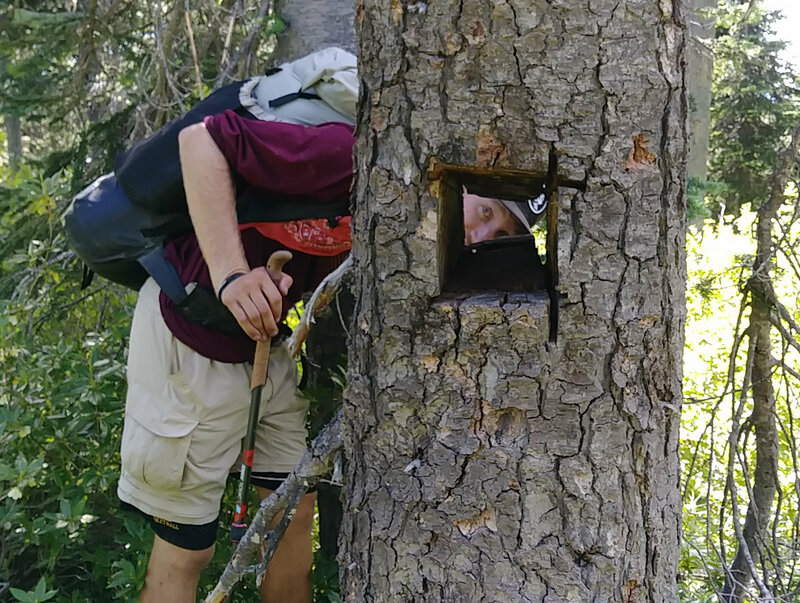 For some reason, a person with a chainsaw cut a hole through this tree somewhere in Montana. The tree is still alive and seemingly healthy, but we could figure out no reason for this. Do you have any explanation for that cut? Or, what strange things have you seen on trail? We did no cooking. This meant there was no stove, cook kit, fuel, or cleaning items to carry. Eating was much faster and easier and we could eat whenever wherever we wanted. This simplicity was a much bigger benefit to us than the cost of having no hot food. And, with the severe fire season, it was good to not have fire of any kind. Tart and sour chewy candies were a huge hit! A bag of Sourpatch Kids was always in my sidepocket and we would each eat a few at most rest breaks. Again, that fruity, citrus taste was what I craved this trip. Jerky - I very seldom take jerky along but it tasted good this time around. Peanut Butter and Jelly - mixed in a plastic jar, this saved weight and the fruity jelly taste was just what I wanted. Fig Bars - Newtons are very expensive but off brands taste just as good. They are dense and once again have a fruit rather than chocolate flavor. Spicey Trail Mix - This was new to me. I found an off brand hot trail mix that was hot rather than sweet. I loved it! Summer Sausage - As a change from tuna, we split a small sausage on tortillas. They are heavy but have a lot of calories and packed just fine for days on end. Tortillas - In the past, I've used ritz-style crackers because they have a lot more calories per ounce than tortillas. But, tortillas pack a lot better, hold food better, and taste good. 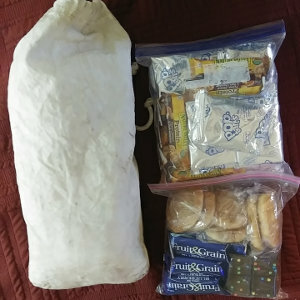 If you have an ALDI store near you, or find one along the trail, I've found they are a perfect place to find backpacking food. Much of it is inexpensive and calorie-dense. Wal-mart is the next best place for this type of food. I've got a food needs calculator that comes pretty close. I bought two pair of Darn Tough Vermont socks for my AT section hike. They were pretty expensive ($17) but have a warranty that states they can be returned for free replacement whenever they wear out. I'm tough on socks. Hiking 20-30 miles a day for two months in dust, dirt, sand, and rock tends to wear everything out. Sure enough, I wore holes through the bottom of all four socks this summer - but not until I'd worn them for over 1,500 miles. They lasted longer than three pairs of shoes! For perspective, when the Darn Toughs wore out, I bought a pack of 4 pair of other socks and wore through all of them in the last 500 miles of my PNT trek. When I returned from my PNT thru-hike, I sent back the Darn Tough socks and crossed my fingers, hoping the warranty was legit. The return postage was a couple dollars. Well, sure enough, this week I just got a small package with two brand new pair of Darn Toughs and my feet have been skipping in comfort on my morning walks the last couple days! Nice padding on the bottom and no extra weight up the ankle. 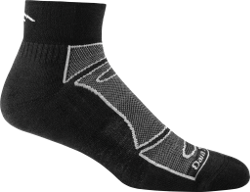 If you are looking for durable, comfortable, light hiking socks with a great warranty that is fulfilled with no hassle, give Darn Tough Vermont a look. I like the 1/4 length ankle socks, but they've got a bunch of styles. 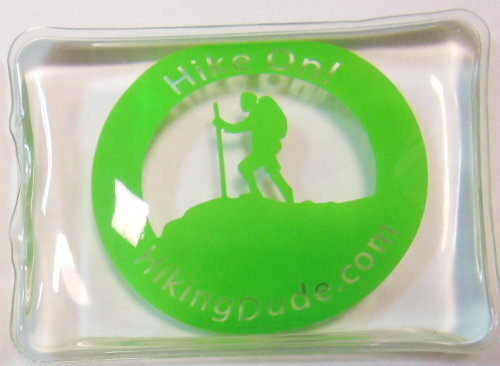 Just in time for cooler fall hikes and Christmas gifts, you can get Hiking Dude hand warmers! Unlike iron powder hand warmers that get used once and tossed, you use these over and over for years. They get reset by sitting in a pot of hot water for a few minutes. Watch the video below to see how fun they are to activate, watch the chemical reaction, and feel the heat. They heat to 130 degrees and last about 45 minutes to an hour. The best thing is that they contain sodium acetate and water - non-toxic stuff. Buy handwarmers and get some free stickers, too. 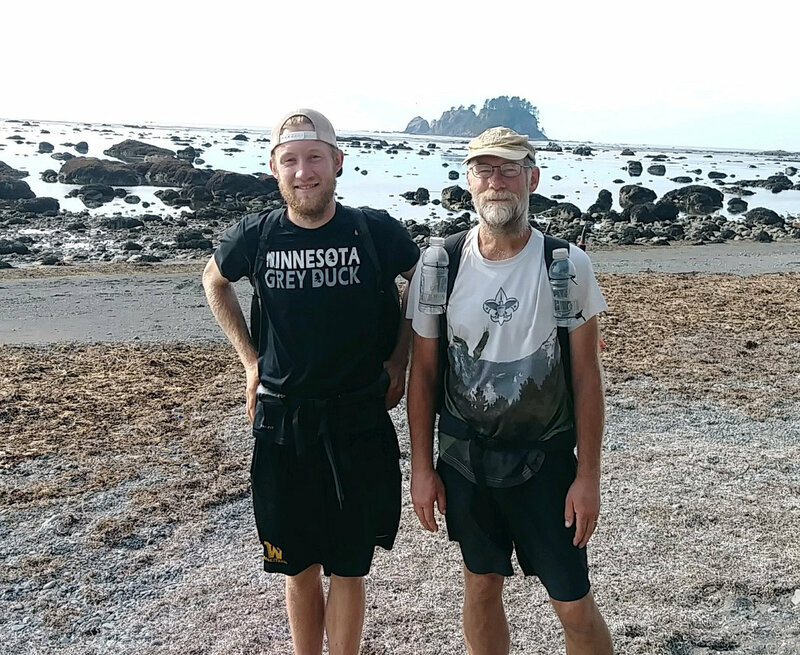 Having reached the end of the Pacific Northwest Trail on Friday afternoon, we had a leisurely 4-mile walk east to the Ozette Ranger Station on Saturday. Our friend wouldn't be picking us up until 3pm, so we lounged around camp on the coast enjoying the calm, misty view of the tide working its way in and eating our extra food. We finally packed up and headed inland. The trail was easy, well maintained, and very crowded with folks hiking to the coast for the day or weekend. Long sections of the trail are a cedar boardwalk, so that was fun but a bit slick in spots. We got bored at the ranger station and decided to walk another 1/2 mile or so down the road to the Lost Resort. As we discovered, they have a well-stocked convenience store and eatery at resort prices. Plus, they have WiFi which we were allowed to use. Eating ice cream and drinking my first soda in a long time, we passed the time. Our ride arrived around 3:45 and we were off. A quick stop in Forks to return the bear can we had rented from Forks Outfitters. Another 3+ hours to Hoaquim where we stopped for a Subway dinner. Finally arriving in Puyallup around 9pm. Bethany was a real trail angel, driving a long round trip to help get us home. In Puyallup, we met Josh's friends and went to a hotdog bar - a restaurant that sells high-priced, fancy-named hotdogs. It was fun to meet them and visit awhile. As it was getting late, we made it to Karin's place where we'd spend the night. We got to sleep in a clean, dry shed in her backyard after taking showers. Sunday was spent in airports and on planes. My wife picked us up at 6:30pm in Minneapolis and we had pizza at home for dinner. That was the end of the trip! I lost about 17 pounds on our trek. Josh lost a lot, but less than that. 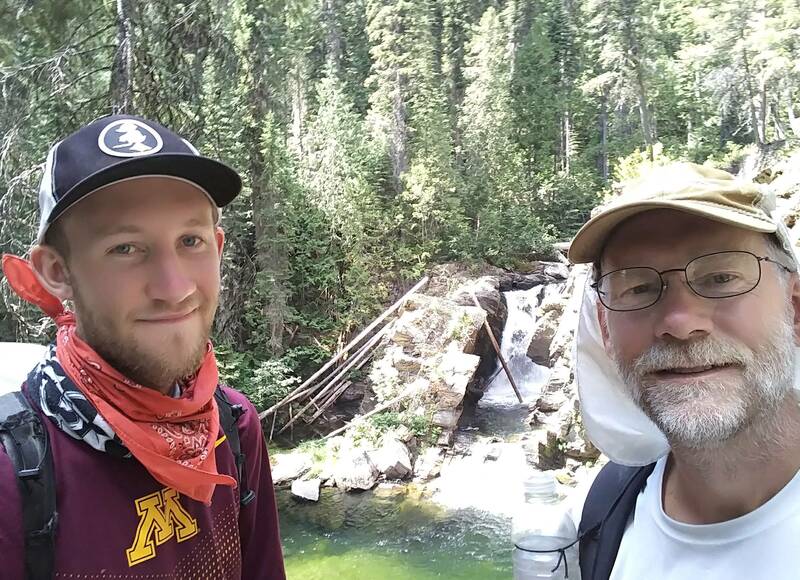 If you'd like more info about our trek and the Pacific Northwest Trail, I've updated my PNT Page with our trail journal, map track, gear, expenses, and other info. Please feel free to ask about our trek, especially if you are planning a PNT thru-hike and have questions.